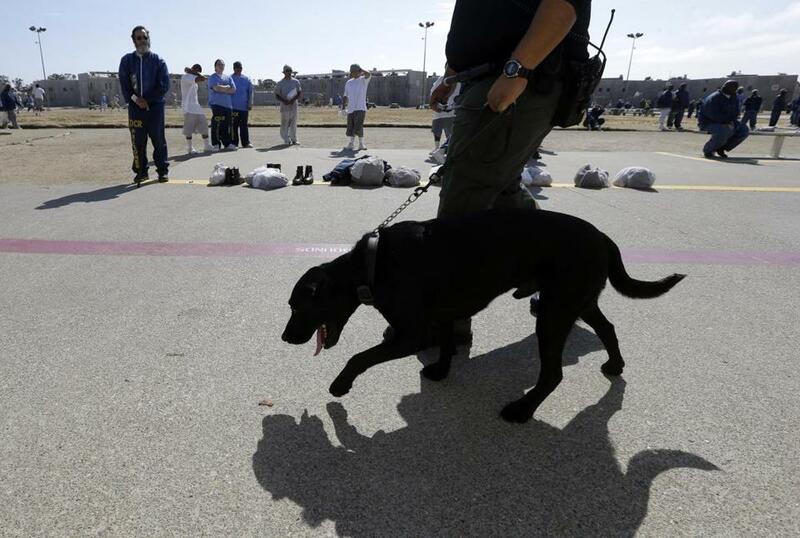 A correctional officer walked a drug-sniffing dog through the main yard at California State Prison, Solano, in Vacaville, Calif., on May 20. VACAVILLE, Calif. — California inmates are dying of drug overdoses at nearly triple the national rate and it’s unclear whether the tough steps state officials took this year to stop illicit drugs from getting into prisons are having any effect, though they are prompting criticism from civil rights advocates. The Department of Corrections and Rehabilitation is spending $8 million this year on drug-detecting scanners and a new breed of drug-sniffing dogs while also employing strip searches on visitors suspected of carrying drugs. Corrections officials believe the stepped-up efforts are discouraging smuggling, but the data that’s available so far doesn’t support that — more than 6,000 scans have been done on visitors and employees at 11 prisons since December without finding anyone with drugs. The state doesn’t track if anyone has been arrested because of the dog searches and waited until mid-May to begin tracking the number of arrests made using any of the new procedures. Meantime, criticism is mounting about false-positive results by the scanners and dogs that can lead to strip searches. Concerned lawmakers who oversee state prisons included language in the California budget plan passed this week that would end the searches and require an evaluation of the department’s other efforts. But no one wants to see drug deaths, and she said the evaluation will show which of the new programs are effective. More than 150 California inmates have died of drug overdoses since 2006, with a high of 24 in 2013. Moreover, the sharing of intravenous needles often spreads hepatitis C infections, which killed 69 inmates in 2013 alone. Beard is modeling California’s new procedures on those used successfully in the Pennsylvania corrections department he led for a decade. While California has a long-term annual rate of eight drug- or alcohol-related deaths per 100,000 inmates, Pennsylvania’s is one. Florida, Georgia, Illinois, Ohio and Texas also each averaged one death a year per 100,000 inmates from 2001-2012, according to the most recent national figures. Maryland had the nation’s worst rate, at 17 deaths per 100,000 inmates. Beard said California’s program would have more rapid success if lawmakers had given him more money, and he may seek funds to expand the program as early as this fall. He believes the ion scanners — similar to those used to screen airport travelers — are deterring smugglers. The lack of results may be because only about 5 percent of visitors and employees are being scanned, he said, though the eventual goal is 30 percent. By contrast, Pennsylvania scanned 68 percent of visitors last year and at least 20 percent of employees. Pennsylvania officials could not say how much contraband was found by using the scanners. Records show the German shepherd and similar looking dogs long used in California prisons have been effective at rooting out hidden drugs. But to search visitors, employees and inmates the department is turning to less aggressive dogs including Labrador retrievers — ‘‘fluffy, friendly dogs,’’ Northern California canine program coordinator Sgt. Brian Pyle said. The decision to use dogs to search humans, instead of unoccupied spaces as was previously the policy, prompted the resignation last fall of Wayne Conrad, the department’s statewide canine program coordinator. He criticized the expense of sending California dog handlers to Pennsylvania for training, the use of breeds that he said are less reliable, and what he said was a supervisor’s effort to stifle concerns about the program because it was championed by Beard. Beard said he is seeking alternatives to strip searches, and downplayed the possibility that false-positive alerts unfairly implicate innocent visitors and employees. But that’s what happened to Tania Gamboa of Riverside when she went to see her brother at Kern Valley State Prison. She initially laughed when the ion machine tested positive for exposure to heroin, saying she doesn’t even drink alcohol. But she was crying after she was required to strip naked in front of two female correctional officers and squat to demonstrate that she was not concealing drugs. ‘‘It doesn’t make sense for me, knowing that I don’t do all that and I got detected for it,’’ she said. Mohamed Shehk, an Oakland-based spokesman for Critical Resistance, which advocates for better conditions for inmates, said the policies are turning visitors into suspects. ‘‘The statistics — $8 million, 6,000 scans and nothing to show for it — show that these are intended to intimidate and criminalize people who are going to see their loved ones inside,’’ he said.